A kurta in Nepal is traditional , usually colourful clothing for women. They come in all shapes, sizes, length, necklines, either with long or short sleeves. They usually are worn with a colours matched pair of pants and shawl, although younger girls and women do wear them with jeans. The fabric for all three is usually sold in sets. There is a sheer unlimited choice of colours and patterns. Most women have them made at one of the many tailors around town. And they are made with incredible speed. 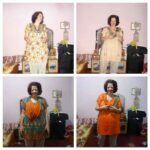 The women’s kurta is very formfitting. The matching shawl is hide the female forms a little bit. Man do were kurta’s as well, but they are usually neutrally coloured (off whites), less formfitting, knee length and without a matching shawl. Many times, man wear a vest or a jacket over the kurta.